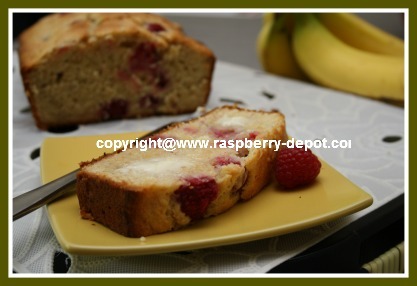 This Raspberry Banana Bread Recipe makes a delicious, moist, healthy raspberry loaf your family will love! This recipe is much tastier than plain banana bread! 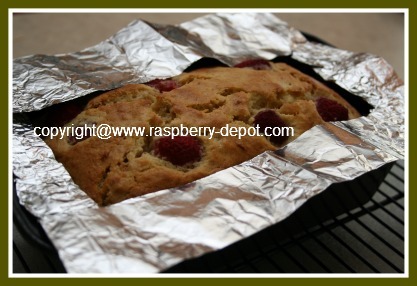 A great recipe idea for snack time, or for the lunch box, using fresh OR frozen raspberries. Yummy Recipe Idea to Make with Raspberries! If you love homemade breads made with fruit that are both scrumptious and nutritious, you have found the perfect recipe here! 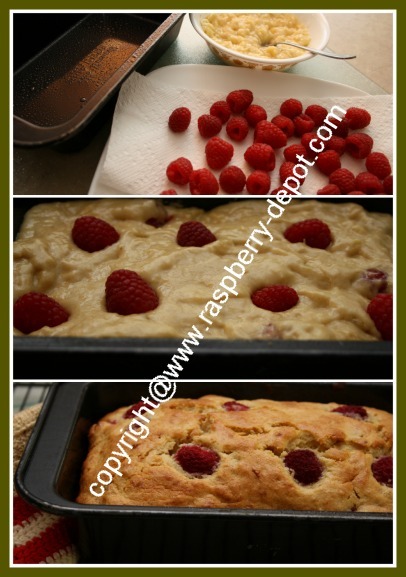 I just finished making this fabulous quick bread with raspberries and bananas, and I am very happy to be able to share this recipe with you ... this recipe turns out amazing every time! Note - if you are using frozen raspberries for this recipe, place the frozen berries on a piece of paper towel and allow them to thaw somewhat before using. In a large bowl, using an electric mixer, cream the butter and the brown sugar until well combined. Gradually add the eggs, while continuing to beat. Gradually stir the flour into the butter mixture, alternating with the milk. Stir just until combined, do not over-mix. Using a wooden spoon, Gently fold in the raspberries (keep a few for adding to the top of the batter), being careful not to break them up too much. Transfer the batter to a 8" x 4" or a 9" x 5" greased baking pan (I used non-stick cooking spray). Add the reserved raspberries to the surface of the batter and press lightly into the batter. Bake at 350° F for about 45 - 55 minutes, or until a toothpick inserted in the center comes out clean. Allow bread to cool in the pan for about 10 minutes, and then remove loaf from pan, and allow to cool on a wire rack. 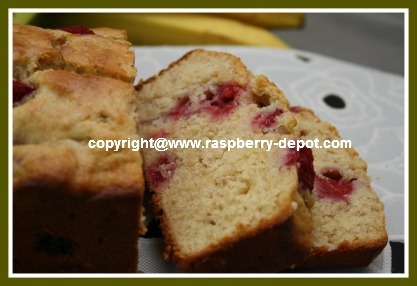 Makes about 10 slices of delicious raspberry banana bread!! 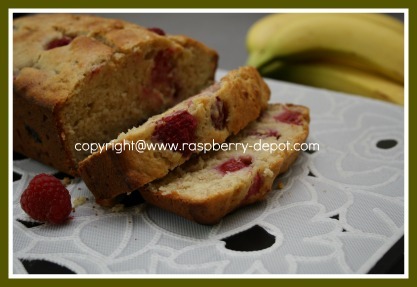 This raspberry banana bread freezes well for up to one month. If freezing this bread, be sure to store it, wrapped in plastic wrap, in an air-tight freezer-safe container. If desired, slice the loaf first, then wrap each slice in plastic wrap, then store sliced pieces of bread in a freezer-safe container ... ready for the lunch box when you are! To avoid the edges of the bread from becoming too dark I like to make a "shield" out of aluminum foil (see picture), and place if over the baking loaf after it has been in the oven for about 30 minutes. Preventing Burnt Edges on Loaf of Bread! I find that this helps prevent the edges of the loaf from becoming too dark and from burning. This is similar to the idea of using a pie crust shield to protect pie edges from becoming too dark.